NADA Convention & Expo 2016 Using a Suite of Innovative Solutions Powered by a2z, Inc.
a2z, Inc. is pleased to announce that the National Automobile Dealers Association (NADA) will be utilizing a suite of powerful and innovative technology solutions to offer networking, matchmaking, event promotion, time saving and planning tools to attendees and exhibitors for NADA Convention & Expo 2016—which is the world's largest international gathering place for franchised new-vehicle dealers. a2z, Inc. is pleased to announce that the National Automobile Dealers Association (NADA) will be utilizing a suite of powerful and innovative technology solutions to offer networking, matchmaking, event promotion, time saving and planning tools to attendees and exhibitors for NADA Convention & Expo 2016—which is the world's largest international gathering place for franchised new-vehicle dealers. The convention offers dealers a rare chance to meet face-to-face with executives of major auto manufacturers and features hundreds of exhibitors showcasing the latest equipment, services and technologies and dozens of workshops with the industry's best trainers. The 2016 NADA Convention & Expo will take place Thursday, March 31st through Sunday, April 3rd, 2016 in the Las Vegas Convention Center. 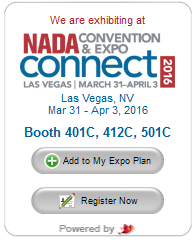 myNADAplanner is an online networking and matchmaking solution that is an integral part of NADA 2016. Attendees have the ability to build a personalized show planner, consisting of their favorite exhibitors, exhibitor meetings and show sessions. myNADAplanner also provides exhibitors the opportunity to create an online eBooth to showcase their latest products and services to attendees before they travel to the show. In addition, each exhibitor is matched with registered attendees who indicate interest in the product categories associated with its company profile. Exhibitors can connect with attendees via direct emails. In addition, NADA is utilizing the ChirpE Mobile App solution to enhance the event participant experience. When attendees download the mobile app, they will see many features designed to help them be more productive at NADA 2016. All selections made in myNADAplanner will be accessible from the event app, along with real-time alerts, local information and social media. Exhibitors will also be able to log in to the exhibitor portal from their mobile devices in order to access their event information or to make any necessary changes. The NADA 2016 Mobile App is available for iOS and Android devices, as well as all internet-enabled smartphones. The eBooth Promotion Widget, a dynamic plug-and-play utility, is available to NADA exhibitors through their online eBooth console. Exhibitors can embed the widget anywhere on their website, blog or e-newsletter by copying and pasting a small block of code, making it one of the easiest and most effective ways of engaging prospective business leads and showcasing their attendance at the event. NADA 2016 attendees can add exhibitors as favorites to their personal show planners and register for the event with a single click. New for this year, NADA is providing registered speakers the opportunity to engage their prospective audience before the show starts with the ChirpE Speaker Promotion Widget. Like the widget for exhibitors, this powerful utility can be embedded anywhere on a speaker’s website, blog or e-newsletter and allows visitors to directly view speaking sessions and register for the event. a2z provides powerful cloud-based event management and marketing tools that grow your brand by accelerating booth sales, helping boost revenue, and enhancing engagement and value for event participants. a2z's solutions are used by 1000+ leading trade shows and conferences across the globe every year. More than 45% of the TSNN Top 50 as well as the TSE Fastest 50 Events leverage a2z's web and mobile solutions. In addition, 44% of shows on the TSNN Top 250 list are managed using our solutions. NADA represents all franchised new-car dealers — domestic and import — before Congress, federal agencies, the media and the general public; and provides education and guidance on regulatory matters. They also represent dealers' interests with automobile and truck manufacturers and develop research data on the retail automobile industry. NADA offers extensive training programs to improve dealership business operations, sales and service practices; and operates a charitable foundation that distributes funds donated by dealers and friends to emergency/medical and educational organizations and private-sector colleges and universities.